Unite LE/1111 and several other supporters of the I'm Bryan campaign protested outside the One Housing Group annual staff conference. At this event, staff receive awards and listen to the senior management explain the corporate plan, outline OHG increasing surpluses, and repeatedly claim that staff are valued despite a six year pay freeze. Unite members and branch officers were distributing leaflets on the pay claim and current updates on Bryan Kennedy. We received a great deal of support from frontline staff, who all knew about Bryan and understood the injustice. Many re-affirmed their support for Bryan in return for all the support he has given them individually and collectively in the past. For example, staff were quick to point out that although Bryan was never due a paycut himself, he worked tirelessly to resist paycuts for his colleagues. Naturally our presence, while being warmly received by members and staff, didn't go down so well with those orchestrating the attack on Bryan. One member overheard a senior team manager saying it was like management viewed the union presence as "a drunken ex-wife turning up on your wedding day". One particularly volatile member of senior management physically manhandled one of our branch officers. Luckily for us, the police were present and the senior manager soon made a hasty retreat reeling with embarrassment and indignant fury that her authority did not extend to bullying staff or manhandling members of the public at will, especially when she thought the police might have seen her actions. We were therefore able to continue our peaceful dialogue with staff unimpeded. After all, we do not seek to personalise matters, we only seek a better workplace for all staff. During the lunch time break we spoke to many members and non-members who were supportive. They told us that staff were instructed by senior management to take off their I'm Bryan t-shirts and wristbands - obviously uncomfortable with the visible display of support for Bryan. Perhaps another sign of senior management's discomfort and fear was shown in the decision to make communication at the Conference one-way only. Generally at the staff conference staff have the opportunity to participate in a question and answer session with their leader, Mick (I'm-on 207k) Sweeney. Yet no such session was scheduled this year. Feedback from conference has been very positive and our attendance at this event has been a big boost both for the members at One Housing Group and activists on the I'm Bryan campaign. 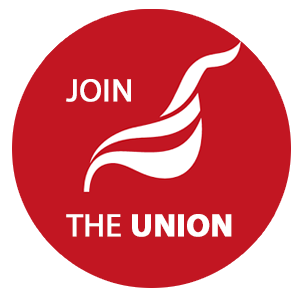 The "Yes" vote is also gathering momentum and many members have already confirmed that they will be voting Yes for strike action. The ballot closes on the 14th May. Please return your ballot paper and vote YES. Please show One Housing Group you are not invisibly shackled by their bureaucracy.